We are excited to share that ForeFlight’s development team recently deployed technology that can recognize missing or corrupted graphical TFRs that are delivered via the NOTAM system. The new tool alerts ForeFlight’s TFR Desk team members, who then take immediate action to correct the TFR graphic and distribute it quickly to ForeFlight customers. In addition to identifying and creating or correcting TFR information, ForeFlight notifies the AOPA’s regulatory affairs team of the discrepancy, who then works with the FAA to correct the information in the NOTAM system. These corrections then make their way back to users via other channels, such as the ADS-B data link system. The team will continue to improve the tool’s capability to also recognize misshapen TFR files. This effort helps us to quickly distribute the most accurate information and minimize the risk that a pilot will violate a TFR area. We are thrilled to announce this exciting addition to ForeFlight. JetFuelX is a free web-based fuel card management service that makes it easy for owners and operators of turbine aircraft to save money by quickly finding the lowest prices available from their multiple jet fuel discount program memberships. JetFuelX is designed to help everyone from individual pilots to large flight departments, including charter operators, quickly pinpoint the best jet fuel prices and eliminate the frustrating and time-consuming task of managing and comparing multiple fuel card and FBO discount programs. Customers can manage unlimited fuel card memberships and aircraft profiles, view all prices available at the planned destination, compare prices in real-time with nearby airports, and submit fuel releases in a matter of seconds. The simple search function returns discount pricing information at the planned destination, as well as the nearest airports, in a neatly organized list or interactive map view. In addition, JetFuelX provides a solution for fuel providers and FBOs to efficiently distribute pricing data to their members. FBOs and fuel providers who are interested in integrating with JetFuelX, please contact info@jetfuelx.com. Existing JetFuelX customers can continue to enjoy the benefits of this free service. If you are a ForeFlight customer, you can also login with your existing ForeFlight credentials and use the JetFuelX platform at no additional charge. New customers are encouraged to sign up for a free account at www.jetfuelx.com. As always, we are on frequency at team@foreflight.com if you have any questions. 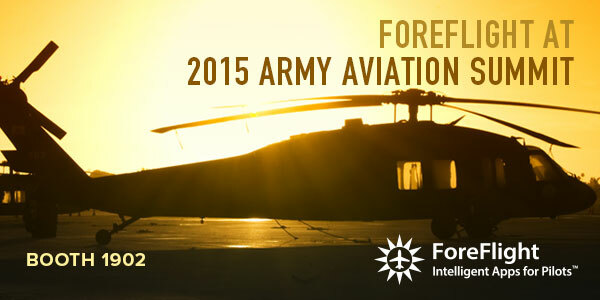 Team ForeFlight lands in Nashville this week to participate for the first time in the annual Army Aviation Summit. ForeFlight is all about making your flight mission easier, safer, and more productive. Come by Booth 1902 for a full demonstration of our Military Flight Bag (MFB) electronic flight bag solution. MFB is your all-in-one app for digital access to charts and maps, weather, route planning, document management, and more. MFB is an enhanced version of ForeFlight Mobile Pro that integrates the global data set of the DAFIF, D-FLIP publications, AQP pages, and geo-referenced D-FLIP terminal procedures, airport diagrams, and enroute charts. See your position on D-FLIP approach plates in the moving map view. Worldwide library of D-FLIP charts and publications within the ForeFlight Mobile app. Safety enhancing ownship position and runway advisor alert. We have extensive MFB deployments in the Army and Army National Guard, United States Air Force, Coast Guard, Navy, and Marine Corps, with major deployments in Air Force Special Operations Command (AFSOC), Air Force Global Strike Command (AFGSC), US Coast Guard, and US Army Operational Support Airlift Agency. We can help get your electronic flight bag program off the ground! Reach out using the form here or see us in Booth 1902 at the Summit. Let’s get going on your ForeFlight Military Flight Bag deployment! A friend sent in this video today. This is some B-roll of the the first ForeFlight marketing video we ever shot of ForeFlight Mobile (back then it was called “ForeFlight iPhone Edition”): version 1.0 from 2007. This was back when “apps” for the iPhone were just web pages. Developers were not able to make native apps until the summer of 2008, when ForeFlight Mobile 2.0 launched. We are pleased to announce our continued support of Able Flight over the next three years via a new series of ForeFlight/Able Flight flight training scholarships. We admire and are inspired by the hard work and commitment the Able Flight pilots put forth to earn their wings. Helping Able Flight to transform the lives of people with disabilities through the gift of flight is a very rewarding way for us to give back to the aviation community. Able Flight’s mission is to offer people with disabilities a unique way to challenge themselves through flight and aviation career training, and by doing so, to gain greater self-confidence and self-reliance. The first recipient of the ForeFlight/Able Flight Scholarship will be in 2015. In addition, Able Flight will be hosting its Annual Benefit Party for the Scholarship Fund in ForeFlight’s headquarter city, Houston, TX, next May. To learn more about Able Flight and to apply for a scholarship, visit www.ableflight.org/scholarships. At ForeFlight we know from first hand experience that weather plays a critical role in aviation and is often the number one worry that a pilot faces before and during flight. To better serve that critical need, we are excited to announce that Scott Dennstaedt has joined the ForeFlight team. Scott has been well-known for his aviation weather expertise for many years, and will now lead the ForeFlight team in the role of Weather Scientist. His background and experience as a CFI, research meteorologist, and founder of the excellent AvWxWorkshops.com provide a unique set of qualifications that will help ForeFlight remain the gold standard among pilots for flight planning and in-flight support. Scott’s overall mission will be to set the direction of the ForeFlight app with respect to aviation weather. This will include advancing the capabilities of the preflight weather briefing while increasing the pilot’s weather awareness in-flight. We couldn’t be happier to have Scott on the team, and we’re excited to move the state-of-the-art forward in aviation weather. If you have any ideas to pass along to Scott or the team, please don’t hesitate to contact us at team@foreflight.com. We are pleased to announce the opening of our new office in Portland, Maine. Between the world-renowned seafood, active arts and cultural community, tech-friendly environment, and home to current ForeFlight engineers, Portland is a great place for a technology company to have a presence. With support from the Maine Center for Entrepreneurial Development and the Casco Bay Tech Hub, Portland is emerging as an up and coming ‘under the radar’ technology hub. We are looking for iOS OpenGL and GIS professionals interested in building innovative mapping and graphics technologies for aviation to join us. The ForeFlight Portland office is located on Union Street in the Historic Old Port area. At age fifteen Megan discovered her home in the sky when she flew with an instructor for the first time. Following that experience, Megan participated in the Southern Illinois University Summer Wings program where she logged five hours of flight time. Since then she has dreamt of finishing her primary flight training. Now nineteen years old, Megan wants to be a flight surgeon or aviation medicine physician, a path that will allow her to pursue both of her passions. Being a Naval or Air Force flight surgeon is in her sights, and beyond that Megan would like to use her license to volunteer for Angel Flight and Young Eagles. Jacob is an active sixteen year old who participates in choir, acting and directing theater productions, tennis, ballroom dancing, and is the youngest member of a numismatic investment and collecting club. Growing up with an Uncle and a Grandfather who were pilots was enough to give Jacob the desire to earn his wings. Jacob would like to become an air medical pilot with the same company for which his Grandfather flew. Helping others in emergency need will fulfill his desire to be a part of something bigger than himself. In addition, Jacob would like to build his own airplane one day. He is currently enrolled in ground school. Stay tuned as we follow these two on their paths to becoming licensed Private Pilots. We at ForeFlight are pleased to announce the availability of two $7500 flight training scholarships for individuals seeking their Private Pilot License. Being a company made up of pilots and aviation enthusiasts, we value the Experimental Aircraft Association’s mission to share and promote the spirit of aviation. We appreciate our customers too, who remind us everyday of all the unique and wonderful opportunities that the aviation industry provides. We are happy to share our success by teaming up with the EAA to offer these scholarships. Apply today and tell us about the unique and wonderful ways you will use your license to fly! We are looking for a remarkable 500-word written essay or video on the topic of “How I Will Use My License To Fly.” Submissions will be accepted starting May 8 through June 30, 2014 and the winners will be announced at the 2014 EAA AirVenture. Full application requirements and submission instructions are available on the EAA website. Happy (future) flying!